their clothes. For them there are these cool Cat Guy Decals. One of these great decals just simply states "Real Men Love Cats." It comes in white vinyl and will look great stuck to any window in your car, home, or RV. You could also apply it to any clean, smooth surface, like the outside of your laptop. It lets the ladies know that you are the strong, sensitive, caring type that they are looking for. Another version is more for the crazy cat guy with a stick figure surrounded by many cats. While it comes in white vinyl, it also comes in other colors such as green, blue, red, purple, orange, brown, and pink. 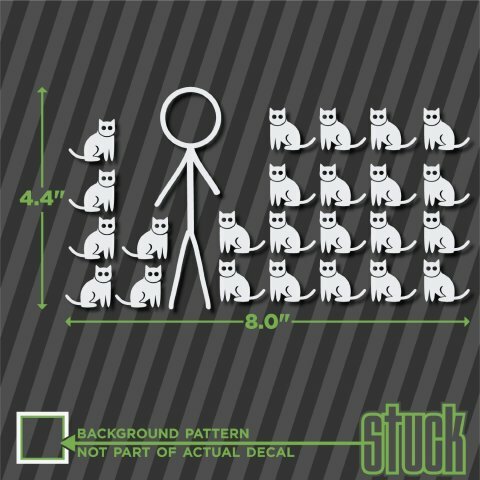 This is the perfect decal for the guy who finds that cats are like potato chips -- you can stop with just one. 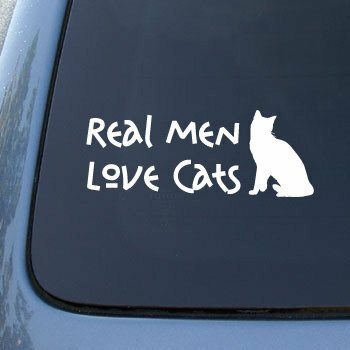 To order your Real Men Love Cats Decal, click here. To order your Crazy Cat Guy Decal, click here. Dogs Take On A Cougar And Win! A Chat with the Creator of Henri -- The Animal Video of the Day!! !